In 1967 the Harrow based Ad Rhythm Records put out its first three 7 inch singles, entitled Add Rhythm. Rather than featuring complete songs, each of them contained four drum rhythms; two on each side for musicians to "Add Rhythm to your own melody". The three singles, entitled Dance Time, Pop Time and Latin Time, are a unique example of technological repurposing; it was no longer your gramophone it was now, "the most effective practice aid a musician ever had". Ad Rhythm Records never put out any further Add Rhythm 7 inches. And for the rest of their career, which lasted until about 1975, they concentrated on popular albums, largely composed using electric organs of various types, and some of the exciting new synthesizers that were starting to appear at the time. In August 2013, I found two of the Add Rhythm 7 inches in a Red Cross charity shop in Hendon. Charity shopping is often a form of media archaeology. Over the years in this same shop I have found artifacts as disparate as a hand-painted Balinese divination calendar and Deutsche Grammophon's eight DVD set of Wagner's Ring cycle. Taking the Add Rhythm singles home two things became apparent: firstly that these rhythms were entirely usable, and secondly that they represented ancestral missing links in the technologies of break beats and sampling. I resolved to use them for my own recordings, but then as I showed off my newly won treasures online, I had a bigger idea: I thought that it would be better if *lots* of people used them for recording. I set up an event on Facebook and invited every musician I know, and they invited a few themselves. It was an opportunity to fool the shopping mall of the latter-day internet into doing something creative. Something more collaborative, obsessional and fetishistic. Something more like the sort of thing that the internet used to be so good at. I was slightly surprised at the enthusiasm of the response. After all, what I was asking these musicians was to record completely original, exclusive tracks, with strict limitations on the form, and with no opportunity to make any money out of the process. 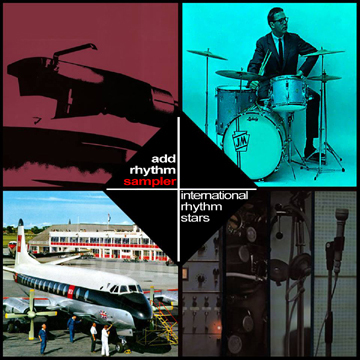 Thank you for taking part in the ADD RHYTHM SAMPLER compilation. The rhythm Rock-a-Latin 33rpm has been chosen for you using the patented Krishna Tombola System. We hope you will enjoy the particular challenges that this rhythm will afford to a musician of yr talent. This rhythm must be used whole and without editing, pitch shifting, timestretching and certainly not reversed - this isn't the 90s, you know? A little EQ is permissable and it is allowed that a recording may precede the beginning of the rhythm or carry on after it has ended. With regards to instrumentation or style: this is entirely up you. Whether you choose to record a colliery brass band or a greyhound belching along to the beat: it's yr trip man! Tracks should be submitted by midnight (UK time) on 30/09/13 in mp3 format, and will appear properly credited on a downloadable compilation on Archive.org. If you decide that you made a horrible mistake getting involved in this charade and have no time for ridiculous online parlour games please let me know and I will remove you from the list with fawning apologies. We look forward to hearing what you have recorded. z~. Most of the rhythms are a little under three minutes in length at 45rpm, and extend to something like a minute and a half at 33rpm. Each rhythm is introduced by a lead-in beat on a wood block and some vinyl crackle. In many cases the artists left the vinyl crackle intact and in one case even resampled and exaggerated it. By the 30th September I had received twenty-seven recordings from the contributors. Over two thirds of the original applications. I was astounded both by the quality and the range of material on these recordings. Certainly I expected some of the playful noise-based reactions to the rhythms but there were a wide range of musical responses using a variety of techniques and even a pleasing array of songs. With most tracks ranging between three to three and a half minutes, the resultant feast is more like a mouthwatering selection of tapas than a stodgy diet of carbohydrates. In summary, I'd like to thank all of the contributors for their hard work and their enthusiasm for this project which has turned a late 60s folly into a living musical chimaera. Whatever ambitions the anonymous drummer and the studio technicians at Ad Rhythm records might have had for their product, it is unlikely that they imagined that over forty years in the future their work would be interpreted in such a variety of colourful forms. Zali Krishna - Add Rhythm Sampler curator. Website & design by Zali Krishna 2013. All tracks are copyrighted by the above artists. See the Creative Commons licence on the Archive.org page.